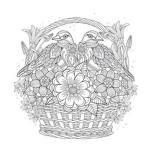 These paper quilling instructions will help you get started on the amazing art or paper quilling. Got your quilling tool, strips of quilling paper and some glue to hand? 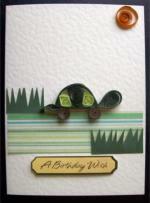 Quilling isn't a difficult craft, but it can take a little practice to get the tension right. So let's practice! Take a strip of quilling paper and tear it in half, or even quarters. Do not cut it with scissors as the sharp edge will be more noticeable in the finished shape. The soft, torn edge is less visible. I would advise you to begin with the slotted quilling tool that is normally provided in a quilling starter kit. Later you may want to move on to using a needle tool or toothpick. A good tip to keep in mind is that when using the slotted tool you turn the tool, whereas with the needle tool you roll the paper around the tool, keeping the tool still. So take your piece of paper and gently put the end into the slot in the tool. Make sure that only the tiniest bit of paper protrudes through to the other side of the slot. Then, holding the tool in your dominant hand and the paper between your other thumb and index finger, slowly turn the quilling tool so that the paper winds evenly around the tip. Try to keep the edges of the paper lined up. Keep some tension on the paper as you are turning the tool, but don't tug too hard or you may tear it! When your quarter length strip is all wound around the tool hold it in place for a moment so that the paper can "remember" its position. Then let go and turn the tool upside down, allowing the quilled coil to fall off onto the table. The paper will begin to uncoil a little, don't panic, it is supposed to do that. Leave it to "relax" a little and then when it stops uncoiling use a toothpick with a tiny dot of tacky glue on the end to stick the end of the paper in place. Hold the paper together for a moment or two until the glue dries. As we are practicing, pick another color of paper and make another coil. Make perhaps a dozen before we move onto the next stage. Sometimes you will want to leave your coils as circles, but often you will squeeze and manipulate them into different shapes to build up your picture. We will start with the easiest shape. Pick up your coil and with the thumb and index finger pinch it together forming a shape with a point at one end and leaving the other end rounded. This is a useful shape for flower petals. Taking your teardrop shape, gently press your pointed end to one side to curve it over. Take another coil and this time hold it between the thumb and index fingers of both hands. Pinch tightly with both hands to form points at each end. The marquise is one of the most useful shapes in quilling. Make another marquise but this time after pinching the ends move them in opposite directions creating a twist in the shape. 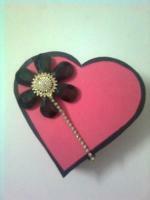 You will need your quilling tool again for this shape. Take one of your coils and push the handle of the tool into the circle, squeezing the two ends to form points. A slightly tricky one this time. Holding the circle between your index fingers of each hand, push the bottom of the circle up with your thumbs to create a triangle. Pinch the three corners to sharpen them up. Start by making the teardrop shape but before letting go of the pinched end push it back into the main part of the circle to form an indentation. Sharpen up the two outside points if required but they can be left rounded. Similar in appearance to the crescent, this shape is made without using the quilling tool as a former. Holding the coil in one hand use the index finger on the other hand to push an indentation into the circle. Then pinch the two resulting points to sharpen up the shape and make the ears. First make a teardrop by pinching one end. 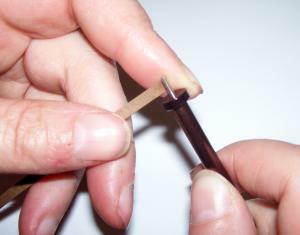 Then, holding the pinched end, use your finger to push the other end towards your other hand forming an indentation. Pinch the points to sharpen up the shape. Make a marquise as before, then turn the shape 90 degrees and repeat, pinching two more points to make a star. Press hard at each point to sharpen up the shape. This one needs both thumbs and both index fingers! Hold the circle between all four digits and gently press into a square shape. Squeeze each corner to transform your circle into a square. A pair of pointed craft tweezers are useful when making this shape which is, of course, great for quilled Christmas cards. Squeeze your circle together in the center using your tweezers. Using your fingers pinch one end and push it towards the center, repeat at other end to form a holly leaf shape. We missed out the first illustration in the photo above. The tight coil is the easiest of all to make. 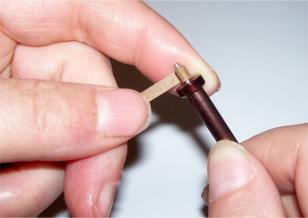 Wrap the paper around the quilling needle as before but before taking it off the tool glue the end in place. Hold it for a few seconds to allow the glue to dry before gently releasing it from the tool. Using the same technique as above for the tight coil but with wider paper we can make a fringed flower or pompom. Start by cutting small snips into one edge of the paper at regular intervals all the way along its length. Then roll a tight coil and glue the unsnipped section. Gently spread the snipped section to produce a fluffy effect. To create a flower with a different colored center take a 3mm wide strip in yellow or a suitable color and glue a snipped wider length of paper in the flower colour of your choice to the end. Start rolling from the narrow end and continue rolling when you reach the snipped paper. Glue as before and then spread open the snipped flower leaving a nice tight center. Open coils or scrollwork can add a delicate touch to a quilled item. This time we do not glue the end of the paper strip once it is coiled. Easy one! Just coil as normal but after leaving it to relax do not glue the end.Open coils or scroll work can add a delicate touch to a quilled item. This time we do not glue the end of the paper strip once it is coiled. Easy one! Just coil as normal but after leaving it to relax do not glue the end. Take your length of quilling paper and fold it in half. Roll from one end in towards the fold line until a small section of paper is left preceding the fold. Do the same for the other end. Try to leave the same amount of free paper on each side of the heart so that it lines up nicely when finished. Worked in the same manner as the heart above, but roll away from the fold line creating the coils on the outside so that the finished result looks like a letter V with outward facing curls on the open ends. There are other open coils you can make, but this page is getting rather long so I'll leave them for a separate page. I hope these basic paper quilling instructions will help you on your way to an exciting and beautiful new hobby. 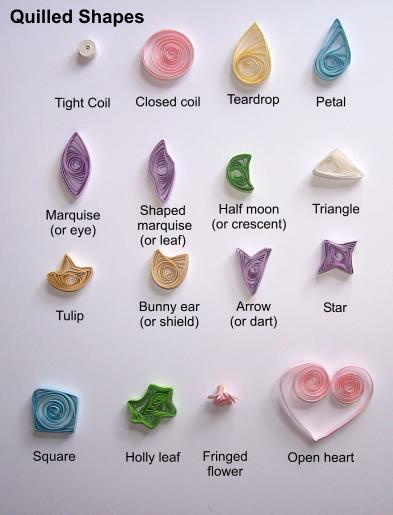 Check my free quilling patterns page for projects to make.